As you may recall from the early days of this blog, I was a pretty big fan of the boy band NLT -- particular of its lead vocalist, Mr. Travis Garland. This past Tuesday, a dream came true for your girl when I finally got to see Mr. Garland perform live (albeit solo) and in the process, I discovered two other new artists that are very worthy of everyone's attention. You will find video footage of Travis' entire set, along with a few clips of R&B indie artist Lydia Caesar after this review. You're welcome in advance. I ducked out of work right on time and headed straight to this event, as they were supposedly letting people in at 7:30PM (they didn't until around 7:50PM -- it was cold, people). However, as my plus one and I were looking around for something to eat, who do we see but Travis himself at the corner of the block, surrounded by his posse. We were literally struck dumb and stared at him through the windows of the bank we were in like pathetic fangirls. So you're asking -- did Mel accomplish her dream and get a photo with Travis? Nope. I know -- I'm disappointed in myself, too. Not long after we spotted him, he zipped into a cab. Sigh. After waiting for what felt like eons in the chilly March(!) New York air, we were let in to SOB's and headed for the side of the staging near the short staircase to physically get on stage. That's right -- everyone walked right by yours truly. The night was kicked off by DJ Lyve, who played a pretty good mixture of new and old school R&B jams ("That girl is poiiii-sonnnnnn"). The show started up about 15 minutes late, and rapper Saint Nick took the stage. Unfortunately, despite his best efforts -- the crowd seemed a bit listless. It became obvious rather quickly that a large majority of the folks there were there for Travis or R&B vocalist Rotimi and -- surprise, surprise -- they both were scheduled for the end of the night. All acts save for Travis (the headliner) performed three songs, while Garland performed five. The first main highlight of the night came with the third act -- an R&B vocalist named Lydia Caesar. She just released her debut album independently, called Caesar, and it's available for purchase on iTunes and perusal on Spotify. Lydia, dressed in slick wet-look leggings, a striped tube top and jacket, and with a signature bow in her hair, immediately won the crowd over with her single "St. Louis" (music video here). Her vocals are front row in center and she's not to be missed. She followed it up with a cover of Rihanna's hit "Stay", heavy with emotion and melisma and putting the original to shame. She closed her set with the euphoric uptempo "Lottery". Following Lydia was Aaron Camper, an accomplished musician who's toured and sung backup for the likes of Jill Scott and Stevie Wonder. This entire week he has been part of Justin Timberlake's backing band whilst performing live on the "Late Night With Jimmy Fallon" program. The highlight of his set was his single, "Madness", which is available on iTuness/Spotify. Many of his songs he vibed and mixed with other hits, including Adele's "Rolling In the Deep" and Gotye's "Somebody That I Used To Know". Aaron is stellar -- a true rising star, and one to watch. And, it should be noted, is a real gentleman both on and off stage. Finally, after nearly two and a half hours of waiting -- I breathlessly watched Travis Garland stand literally a foot from my face waiting to take the stage. Dressed in a black shirt, jeans, a flannel button-up wrapped around his waist and a dark fedora, he took the stage with a full backing band. He was playing mostly in support of Fashionably Late V. II, the second part to his stellar Fashionably Late mixtape that was released a few weeks ago -- it's every bit as solid as its predecessor. His set opened with a dreamy fusion of two v. II midtempos, single "Where To Land" and "Blue Electric Roses". During his second song, his mic started to fade and finally drop out on him, but he handled it like a pro, simply picking up another mic and continuing on to a large applause. I'm sideyeing the sound mixer for that -- there were no other audio glitches save for that (haters be hatin'). After this, he offered up an unexpected (to me, at least) cover of D'Angelo's "Untitled (How Does It Feel)" and yes, women lost their mind. And I don't mean just me, either ("That white boy can singggggg!"). He closed the night out with another v. II jam, the cheeky "Homewrecker" and my overall fave mixtape!Travis song "Abby Lee". We were brought to church, ya'll - and I dare say I've seen the light. 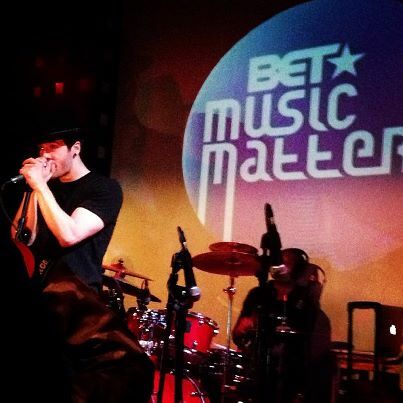 If you are in the New York area and are interested, the BET Music Matters showcases are free to the public (so long as you are 21+) and are held monthly at the SOB's bar in Soho. For more information, check out their Facebook page. For more information on Travis, Lydia or Aaron, I suggest you follow them on the Twitters: via @TravisGarland, @LydiaCaesar and @AaronCamper respectively. You can download both Fashionably Late and Fashionably Late v. II, Travis Garland's two most recent mixtapes, for free at his website. Check out my videos of Lydia & Travis below or via my YouTube channel.